Tam Tam Café and Tam Tam Jardin have been some of the most popular restaurants here since 1996. Why Tam Tam Restaurant & Bar is special ? The charming, old French building that houses Tam Tam Café has a downstairs area with a free pool table and bar, where dancing is held on special occassions. 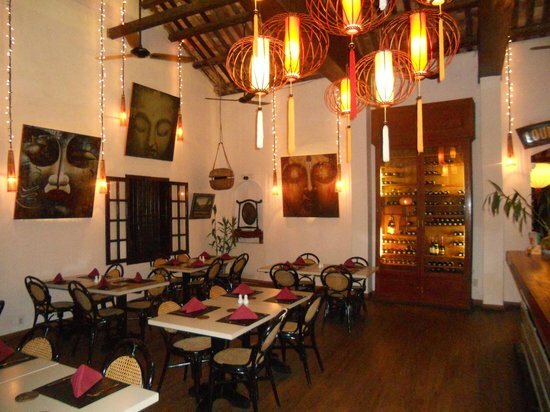 Its spacious upstairs can sit up to 150 customers with private dining rooms. On the other hand, Tam Tam Café is housed inside a beautiful ancient Ruong house and its charming garden is a perfect place to enjoy dinners underneath the famous Hoian lanterns. Down stairs is a nice bar with a pool table, upstairs is the restaurant, some outside tables or you can sit in with AC. Friendly staff rounds out the dining experience. Tam Tam cafe and restaurant provide Great Vietnamese food at a good price and excellent service from all the staff. There is also a great bar downstairs which gives you a great view of the street life passing by. They offer great France baguette sandwiches and great French deserts. It is nice to sit on the porch and watch the people walking by. Had Vietnamese iced coffee and cake here after strolling around old town. Cafe was very clean and coffee and cake excellent. Didn't have a meal. Nice place to sit down and relax. Ask to sit upstairs on the balcony outside so you can people watch on the street down below. Lovely setting with pleasant staff and delicious food. Spring rolls were crispy and delicious and the chicken curry was lovely and tender. We visited the week before the Lunar new year so the staff were in a bit of a rush to close early so we didn't get to sit around and enjoy the place afterwards but I don't hold that against them, it was Tet afterall! Had a great meal here one evening sat outside up stairs overlooking the street watching the world go by. The selection of foof from the menu was extensive and when it arrived it was more than adequate in terms of quality, presentation and quantity. The service was also was good and the staff were more than willing to ensure that you had a good stay. Have a look round the property itself as with the majority of the property in Hoi An it is like a little time capsule and is entertaining in itself. Can recommend this as a location for a meal and would go again if the opportunity presented itself.